If you rather read, here is the text. This is how it’s done. W, of course, has experience, having a few years ago written a lovely short biography of his father, titled “41”, which I also recommend (I’m partial not just because I have a nice first edition signed copy). I have not written about Bush Sr.’ s passing away because I haven’t had much to say about the man. I was always more a Reagan than a Bush man, and was more ambiguous towards the latter’s Presidency, though clearly much preferring it to any alternatives. I remember rejoicing in November 1988 upon hearing the news of his election, while living my last few weeks in Italy before coming to Australia. I followed the first Gulf War with bated breath while in high school, but was somewhat less impressed by the 41st’s often timid and confusing approach towards the collapse of communism and the disintegration of the Soviet Union. He wasn’t quite my kind of guy, but he seemed a gentleman and a sincere, honourable man. There seems to be fewer of them around these days. Somehow no one has lived up to the Greatest Generation’s record and performance thus far. The fact that we mourn George W H Bush so much today, a rather grey man and (his astronomical spike in popularity during the Gulf War aside) not particularly enthused about at the time or subsequently, only goes to show two things, which are not necessarily contradictory: the past acquires a healthy golden glow the farther away it recedes, and in our crazy world of 2018 we miss steady and decent people like him. Rest in peace, President Bush. P.S. It’s another sad statement about our times that there were supposedly negotiations and deals done to prevent the funeral from becoming a repeat of John McCain’s hate-fest against Trump. Everyone knows that Trump and the Bush family dislike each other, and that the Bushes have been for a long time close to the Clintons, with George Sr. even voting for Hillary at the 2016 election, but there are some times when mature adults should know when to stop and put differences aside for the sake of decency and decorum. 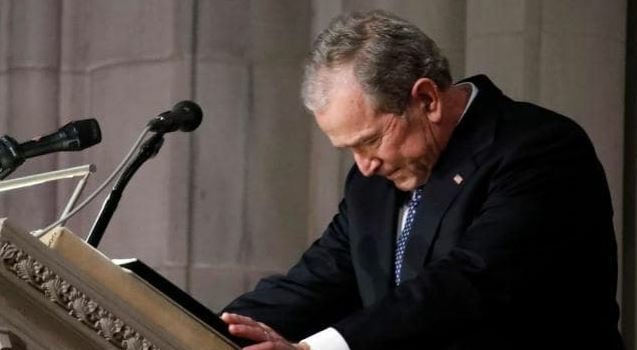 George W Bush will deliver one of the eulogies with former Canadian prime minister Brian Mulroney, former senator Alan K. Simpson, and Bush biographer Jon Meacham. None of the eulogists are expected to mention Trump with Simpson telling the Post that the memorial service for Bush was neither the time or place to get into politics.